Global: If you want to use the same command when working in different applications, you create a Global command. Application-specific: If you plan to use the command in a particular application, like Microsoft Word, then you create an Application-specific command. Window-specific: If you’re going to use the command in a specific window, like your e-mail program, then you create a Window-specific command. Type (or say) the new command name where prompted. 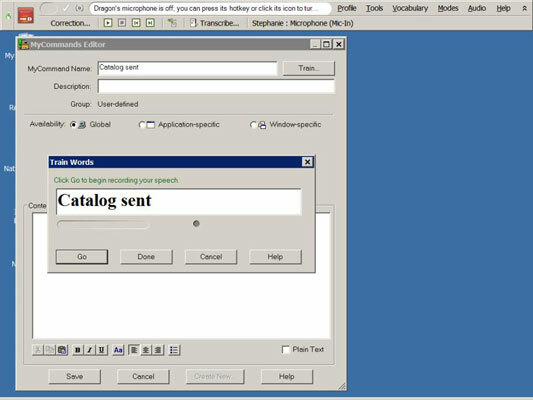 In this example, it’s called Catalog Sent. It’s best if you name the command something distinctive that you can remember. You may also want to format it using “Title Caps” or “All Caps” so that you can spot it easily. Click the Train button so that your command will be recognized easily. A Train Words screen pops up so that you can dictate the name. Speak the command as you would normally. Leave the Group as User-Defined. You can change this only if you have the Dragon Professional edition or higher. If you choose, you can enter a description in the Description box. Below that, where you see Availability, select the radio button for the type of command you create. For this example, choose Application-specific. You see a drop-down menu with a prompt box to type in your open application (or say it) or click the Browse button to select the application from your hard drive. Leave the Command Type as Text and Graphics. 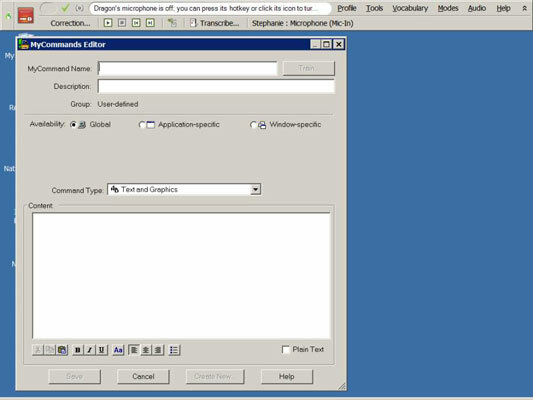 Type or dictate the content into the large dialog box. You can also cut and paste boilerplate text into the window of the dialog box or highlight it and say, “Make That A Command.” NaturallySpeaking will automatically pop open the Command Editor and paste it in. Select the Plain Text check box. Putting a check mark in this check box lets the program know that you want the content to pick up any formatting you are already working with in Word. If you format it while creating the command, don’t select this box. Test your new command right after you save it. You don’t want to find out you made a mistake when you’re in the heat of dictation. In case you’re wondering, you can use the command you just created with any combination of other commands and dictation. For example, you can dictate a second paragraph on-the-fly that pertains to that specific addressee. In the same e-mail or document, you can put in additional commands, like your signature or address. You can mix and match them to customize it.